Wow, thanks for sharing Erik! It's great to hear that you're digging the game so far! 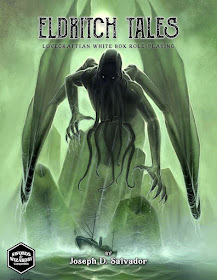 I was lucky enough to have seen Eldritch Tales some time ago,as Joe asked me to do some editing for it. I've been waiting a while for the final release as this is SO GOOD. Looking forward to running it at upcoming events and at home. Sounds good, Joe. Any plans to go POD? I just dropped an update to my blog yesterday and talked about upcoming plans. Short answer - yes, color POD on OBS, B&W on Lulu; hardcover and softcover for both. Thanks for your interest! Yes, Joe's game Eldritch Tales is a home run! Can't wait for the print copies to become available!